Home/Jurisdictions/In The News: From Coast to Coast! 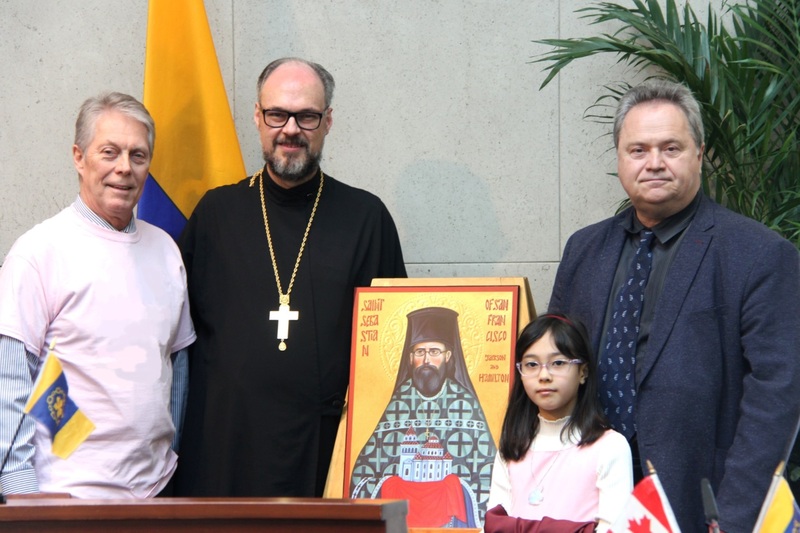 The City Council of Hamilton, ON, Canada, was presented with an icon of its own resident saint on April 10, 2019. “Saint Sebastian was the priest of the first multi-cultural Orthodox parish right here in Hamilton’s east end, on Beach Road, over a century ago, where people from many cultures worshiped together in the English language, at a time when such a faith community was a rare and unusual thing,” said Archpriest Geoffrey Korz, Dean of Ontario and Rector of Hamilton’s parish of All Saints of North America, who presented the icon. Last year, Hamilton City Council voted to grant an honorary street renaming in memory of the saint. Father Geoffrey also entrusted the mayor with the responsibility to serve as keeper of the icon. Bishop David with faithful after Annunciation Liturgy. 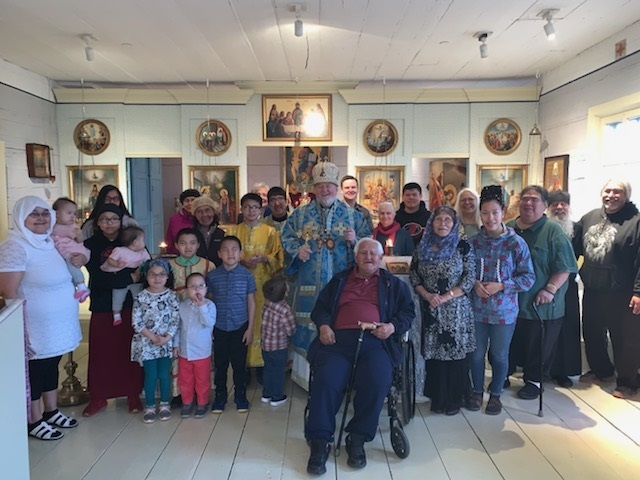 On Sunday, April 7, 2019—the Great Feast of Annunciation on the Julian Calendar—His Grace, Bishop David celebrated the festal Divine Liturgy at Holy Annunciation Chapel in Sitka’s historic Bishop’s House. The Bishop’s House is one of the few surviving examples of Russian colonial architecture in North America. Completed in 1842 in New Archangel, as Sitka was known at the time, the Bishop’s House includes the chapel dedicated to the Annunciation by Saint Innocent Veniaminov. In 1973, the National Park Service acquired the property and initiated a 16-year project to restore the structure, which as a major attraction in the city offers visitors a glimpse into life during Alaska’s Russian-American era. While in Sitka, Bishop David also met with Mary Miller, Park Superintendent, concerning the possible exhumation of the relics of Saint Jacob Netsvetov in time for 50th Anniversary of the Orthodox Church in America’s reception of Autocephaly, slated to be celebrated in 2020. See related story. Jacob’s Well—the official magazine of the Diocese of New York and New Jersey—is now available in digital format, according to its recently appointed editor, Priest Matthew Brown. Two issues are published annually, in the Spring and the Fall. Printed copies are also available. Subscribe online. Back issues are also available. Jacob’s Well is also available on Facebook and Twitter. 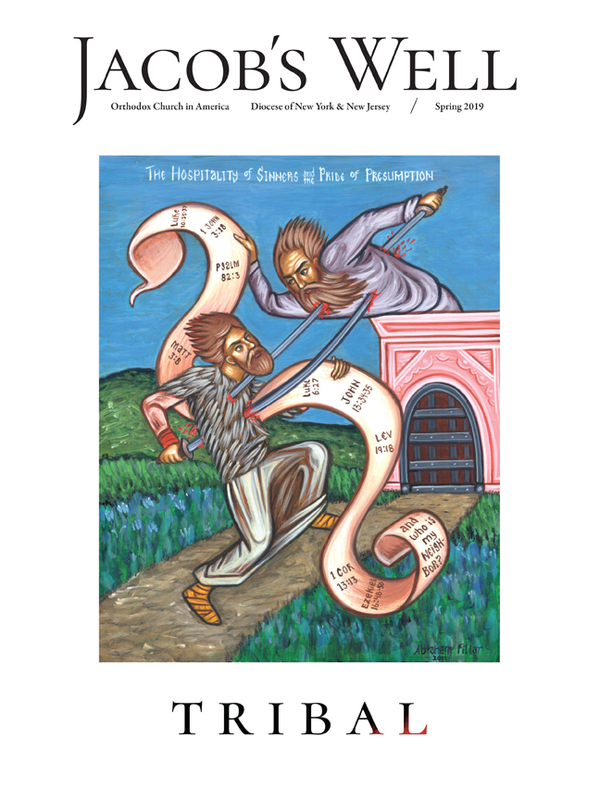 Article submissions and general inquiries may be sent to Father Matthew at editor@jacobsmag.org. Fr. Alexander Koranda with OCFers at lenten retreat. 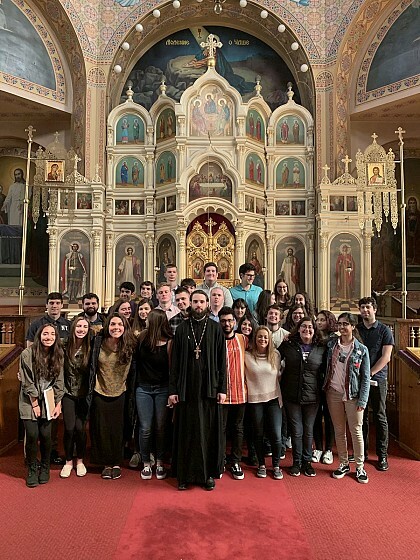 Some three dozen Orthodox Christian college students from Chicago, Wisconsin and Indiana were welcomed at Chicago’s historic Holy Trinity Cathedral for an Orthodox Christian Fellowship lenten retreat led by cathedral Dean, Priest Alexander Koranda, on Saturday, April 6, 2019. Father Alexander also led an enlightening discussion on prayer, based of the teachings of Saint Theophan the Recluse, and discussed a variety of other topics, including Church and Society.